Hemi Walker – Ngāti Porou i te taha o tōna hākoro. Ngāi Tahu, Ngāti Kahungunu ki Wairoa, Tuhoe i te taha o tōna whaea. Another year has almost come and gone. On a financial note anyway another year has passed and our accounts are with the auditors making sure all the numbers are correct. In terms of financial performance it has been a successful year and if you would like to find out first-hand how things have gone you are invited to attend our Annual General Meeting to be held at the marae on Monday 27 November starting at 6pm. It will be a chance to review the year and catch up on some of the projects happening at the marae; and share kai. In March we underwent a quality audit by the Canterbury District Health Board in relation to our Kaumātua Services. We have recently received notice that the Kaumātua Service meets all the requires of the CDHB which is great news thanks to the hard work of our marae management team Raylee and Elena and Maureen and Sammi who run the service. The audit was a good opportunity to refresh some of our policies and procedures right across the marae and stands us in good stead for the future. We are currently working on a website for the marae having received funding from the Christchurch City Council and plan to have it up and running before the year is out. It will be a place for our marae and trade training history as well as a useful tool for management and Kaumātua Services. Our church services continue to be well attended with our Kahui Kaumātua meeting regularly following the service. Ruawhitu Pokaia continues to support the kāhui and they are working together to establish tikanga guidelines for the marae. Last year we held our first Carols at the Pā; and this year we are doing it again on Friday 6 December. Whānau and community groups are invited to run stalls and we have a great line up of entertainment, and of course, lots of carol singing. Bring a blanket and a picnic and enjoy an evening with whānau and friends. We have had a detailed inspection of our sewer and waste water systems undertaken recently. We have experienced some issues with blocked drains over the past few months. A specialised camera was used to determine what the problems are and if they are related to earthquake damage – we will be talking to our insurers about repairs. Computers in Homes is a 10 week course that got under way at Rehua in October. It helps provide whānau in need with a computer and the necessary training and support to use it in the home. We have a full complement of 10 kaumātua from our community taking part in the course and the opportunity to run further courses if there is demand. For a small fee participants are able to purchase a computer and receive free broadband installation and service for a year. The programme is run out of DORA (Mobile Digital Learning Centre) an old school bus that is kitted out with all the mod-cons. This course follows on from the successful e-Kaumātua course run by Hagley Community College. 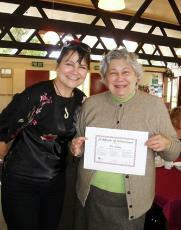 Harry, Tatiana and Ria are pictured with Roz receiving their e-Kaumātua course certificates. 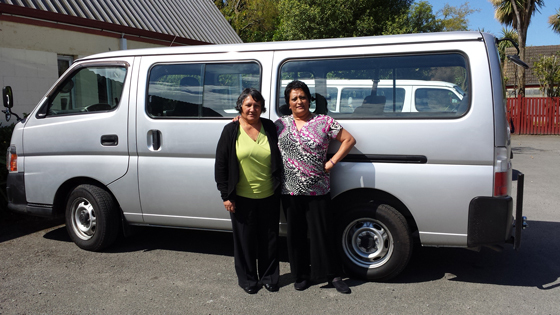 We have been able to purchase a new van for the marae. Our old van has given us good service, but after many years it is tired and ready to go out to pasture. We applied to First Sovereign Trust for a grant and were successful in securing $20,000. We are very grateful and wish to thank the Trust for supporting the marae to provide a valuable asset for our Kaumātua Service and the community. The new van is a 2008 Nissan Caravan capable of carrying 10 passengers with all the mod-cons. Maureen, Sammi and our new van. 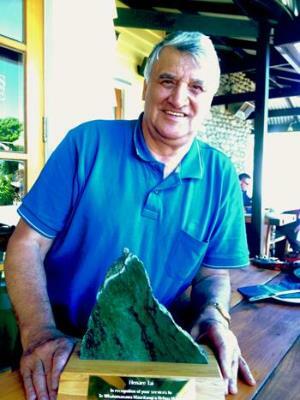 Henare ‘Bob’ Tai the former Trustee and Te Whatu Manawa Māoritanga o Rehua chair was recently presented with a pounamu taonga in recognition of his years of service to Rehua Marae and its community. Bob is now based in Tauranga , but still has plenty of reasons to return to Ōtautahi. Registered nurse Megan Karena (Ngāti Kahungungu), was welcomed to Kaumātua Services with a pōwhiri held at Purapura Whetu offices on November 4. 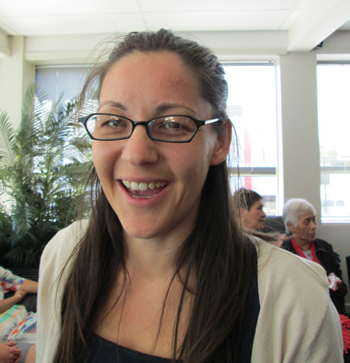 Megan has just returned from overseas after two years and has been a registered nurse for many years. Megan previously worked with Hokonui Rūnanga Social Services in Gore and will provide 20 hours a week clinical support to kaumātua utilising our Rehua Marae Day Care services and a further 20 hours working with Purapura Whetu in a postnatal infant project. The collaborative arrangement with Purapura Whetu is unique and welcomed by CDHB as an innovative solution to a Maori Workforce issue. Audrey Browning (Grandmother), Sharon Lee (Aunty), Megan and Michael Karena (Brother). 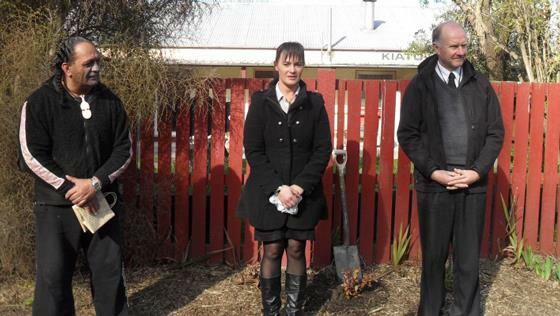 Te Mairiki Williams, Sunny West (Teacher) and Tony Simpson (Principal), of Phillipstown School planted a Horopito (Pepper) tree as their koha to the marae and as a memorial tree for the school. 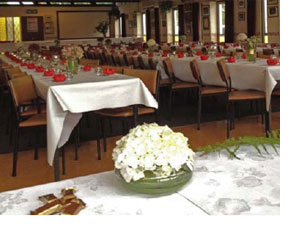 The Marae to Marae Hīkoi was held on 4 October. 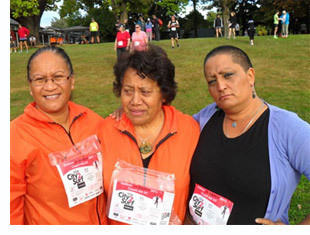 The 6.5km walk from Ngā Hau e Whā to Rehua was organised by He Oranga Pounamu and the Christchurch City Council. 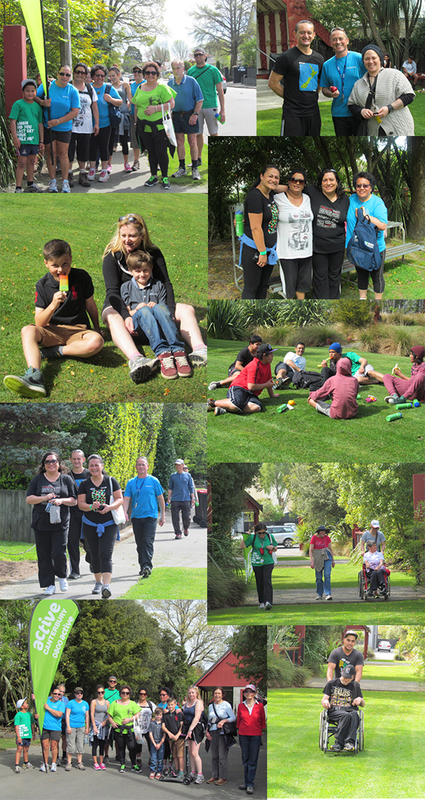 Raylee, Sammi and Trustee Maania Farrar joined more than 70 whānau for the walk which was one of 25 planned walking activities for the Walking Festival held in Christchurch from Friday 27 September to Sunday 6 October. Calendar – what’s coming up! Rehua whānau and community are invited to join the Trustees for the AGM. It will be an opportunity to hear about the financial position of the marae, potential options for the redevelopment of the marae and its buildings as well as share a kai and kōrero. Nau mai haere mai koutou. Please contact Elena to RSVP to help with catering. The marae phone will be monitored during this period for important matters such as tangi. Rehua is building a database of names and addresses and invites all old boys and girls and whānau to contact us with your details. Your information will remain confidential and will allow Rehua to stay in touch with you and let the community know what’s happening at the marae. Kia ora koutou, with Matariki in our skies it signifies the start of the Māori New Year – a time for planting and harvesting and new beginnings. It is also a time to celebrate and acknowledge those things that make us unique, but also unite us as Māori and New Zealanders. At Rehua it has been a time to open our doors to the community and invite whānau in to share and celebrate this special occasion with us. Many hands have helped make this Matariki one to remember, from our kaumātua luncheon, the kapa haka performances to the fabulous range of workshops. We hope you were able to be part of the celebrations – and to all those that contributed to the festivities – we thank you. It is my pleasure on behalf of the trustees to welcome Maania Farrar to Te Whatu Manawa Māoritanga o Rehua Board. Maania and her whānau have a long association with Rehua and we are excited to have her skills and enthusiasm on the board. Maania attended her first meeting in May. Nau mai, tauti mai e te uri o Waikato. There has been much to keep the board and the marae management team busy since our last pānui in March. In particular we have been working with the Canterbury District Health Board and Access Health Services to ensure our Kaumātua Services have continuity and the opportunity to prosper. Due to changes in the delivery of health services across the sector and new levels of compliance we have had to make some changes to ensure our services continue uninterrupted. The kaumātua utilising our services will not notice any changes, but behind the scenes we now have a formal relationship with Access Health Services to fulfill two of the three CDHB contracts. Access is an accredited provider and under their umbrella our long serving staff, Maureen McManus and Sammi Donaldson are able to continue to look after our kaumātua until Rehua is in a position to achieve the new accreditation and delivery standards. This has provided some challenges, but Rehua has had the full support of the CDHB and Access through-out the process and we owe them a huge debt of gratitude. We have also been assisted by Purapura Whetu Trust in an advocacy role which has proved invaluable. The board believes that ultimately this will create new opportunities to grow and strengthen our Kaumātua Services and the relationships we have in the health sector. There is still plenty of work to be done and we will keep you informed as this progresses. We are also very pleased that progress is being made to safeguard the Rehua archives that Uncle Terry and Aunty Marlene have done so much work to organise and safeguard. We have an agreement with the Christchurch Public Libraries and the support of the Rehua Kahui Kaumātua to temporarily shift the archives to a safe and secure site where the work to digitise the archives will begin. This is a very generous offer by the library staff and we have every confidence that these taonga will receive the best of care and will be returned to the marae when we are ready to properly care for them for the benefit of future generations. Right now the archives are still at Rehua, but we will be arranging an appropriate way to shift them to their temporary home. We also want to acknowledge He Toki ki te Rika, Peter McLean and his trainees that have put in many hours of work to help improve the marae and the grounds. Kia ora mai rā. On behalf of the board I also want to acknowledge the contribution of our kaumātua, those kaikōrero and kaikaranga that take time from their busy lives to whakamana the marae and uphold its tikanga and kawa. Also, we must mihi to our tenants and their staff, Te Puni Kōkiri, Mahaanui Kura Taiao and the Kōhanga Reo that contribute to the unique life and vitality that is Rehua today. Also to our hard working kaimahi Raylee, Elena, Harry and wharekai ringawera who are doing a great job keeping the marae busy and looking pristine and creating a place we can all be very proud. Born and raised in Ōtautahi Maania Farrar descends from Pare Waikato Pare Hauraki, te waka o Tainui. 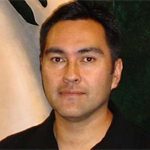 Maania works for He Oranga Pounamu as the Waka Ora Programme Manager under Whānau Ora. Previously she spent 12 years in the public service sector working under portfolio’s held by Minister Turia. She provided secretariat, advisory and policy support for the Whānau Ora Taskforce from the Ministry of Social Development. 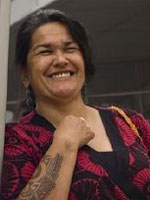 In 2011 she was appointed as a Whānau Ora advisor for Te Puni Kōkiri. Maania’s whānau have a long history with Rehua. Her nanny, Aunty Maera, travelled from the Waikato to Christchurch with Te Puea for the opening of the marae and they have continued to support it since those days. Our Koroua and Kuia Day Support service has been working with Hagley Community College to run computer courses for kaumātua. Our kaumātua and those being supported by Purapura Whetu Trust have been enjoying a 10 week course every Wednesday introducing and up-skilling them on the world of computers and the internet. On Tuesdays our kaumātua take part in th e programme offered by Te Awa o Te Ora which has kindly been supporting our service since the earthquakes, for which we are very grateful. We are looking forward to the day that we will be able to return the day support service to Rehua on a fulltime basis. mulched all the branches to spread on the gardens. We plan to have another working-bee later in the year. We would like to thank He Toki ki te Rika (Māori Trade Training) for the work they have done over the last two months around the marae grounds. They have replaced all the old picket fences by the kaumātua flats, replaced rotted palings on the boundary fences and built a “garden shed” at the rear of the marae. It has seating and a built in ash tray – so it’s not unusual to see the odd smoker enjoying the new “garden shed”. Many of the materials were donated so the work has been completed with very little cost to the marae. Thank-you to Peter McLaren and his trainees for the very good work they have done. 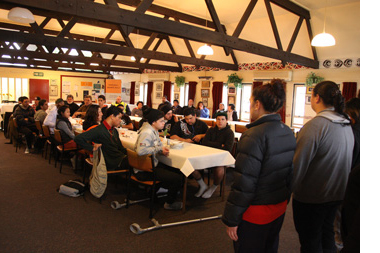 We held a luncheon to say thank-you to the He Toki crew and the partners Te Tapuae o Rehua and Hawkins that do so much to support and grow the programme. The luncheon ended with a performance from the Aranui High School kapa haka group and presentations by two Māori Trade Training old boys from 1954, Ruk Wainohu and Peg Wairau who lived at the Rehua hostel. They talked about their own trades journeys and how Māori Trades Training supported them. It was wonderful to see things turning full circle 60 years on. Hundreds of people converged on Rehua Marae this year to celebrate Matariki and the beginning of the Māori New Year. Festivities started with an evening of kapa haka and a presentation on cultural mapping by Takerei Norton from Te Rūnanga o Ngāi Tahu. It was a great evening with about 100 people attending. The following day was one of the highlights of Matariki with our kaumātua luncheon. 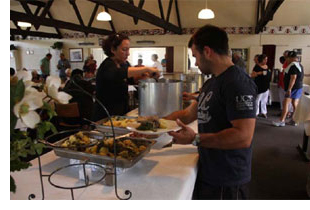 About 60 kaumātua were welcomed to the marae and then treated to a delicious lunch with a seafood platter for starters followed by a roast and dessert. They were entertained with waiata by Sharon Russell. It was a beautiful afternoon enjoyed by all and a lovely opportunity to spoil our kaumātua. Unfortunately Thursday night’s planned events – kapa haka and story-telling by the Christchurch City Libraries had to be cancelled due to a tangihanga. The culmination of the week was on Saturday with a series of well attended workshops including jewelry making, raranga (weaving), mirimiri (massage), māhi toi (art), storytelling and tamariki activities. There were also presentations about Matariki, rongoā Māori, raranga as well as kapa haka performances. The afternoon was topped off with a hāngī and closed with karakia. A huge mihi to Te Puni Kōkiri and Te Rūnanga o Ngāi Tahu who supported with sponsorship. Also Ngāi Tahu Seafood and Hera Maxwell who gave us a generous kaimoana koha for our kaumātua luncheon, Community Public Health Christchurch City Libraries, Ngā Manu a Tāne, Te Amokura, Te Ahikōmau a Hamoterangi and Mareikura and all those others that donated their time and efforts to make Matariki 2013 a wonderful celebration. The marae has solid bookings every week for the next few months with schools, hapū, iwi and whānau hui, including hosting National Māori Squash Tournament in October. Make a note in your dairies for December when we will be having “Carols at the Pa”. Te Whatu Manawa Māoritanga o Rehua has provided a range of services and support to whānau and the local community, ensuring that kaupapa Māori values, beliefs and cultural practices are accepted and promoted as part of the healing and empowering process. An opportunity has arisen and is available for immediate appointment. Whānau Ora Nurse (0.5 FTE) primarily focusing empowering Kuia and Kaumātua to improve their health and wellbeing. The role is Kaupapa Māori based. This position represents an excellent and challenging career opportunity for candidates with drive and an ability to share our dedication in supporting whānau in the community. A position description is available and can be obtained by contacting: Maureen McManus (mail to: mmcmanus@rehuamarae.org.nz) or (03) 355-5615 option Kaumātua Services. Applications close: 5pm, Wednesday 18th July 2013. Nō reira e ngā mate, haere, haere, e oki atu rā. Ko Ngāti Pahauwera tēnei, ko Ngāti Kahungunu tēnei e mihi kau ana. E rere ana te manako nui ki a koutou i runga i ngā tini āhuatanga o te wā. Ko Te Whatu Manawa Māoritanga o Rehua e tau nei. Mā tini, mā mano ka rapa te whai. It is a great pleasure to be writing my first message as chair of Te Whatu Manawa Māoritanga o Rehua Board of Trustees. As the son of a Rehua Māori Trade Training old boy it is an honour to be involved and contributing as the next generation. 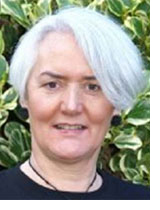 On behalf of the Trustees I want to acknowledge Dora Langsbury who recently stepped down as both chair and a Trustee. 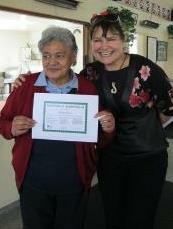 Dora dedicated much time and energy to the marae and our community over the past 18 months. She guided the board and supported staff through a period of change and her commitment and enthusiasm will be greatly missed. You will see Dora around the marae from time to time as she continues to juggle her busy life and remain active in the Rehua community. Tēnei te mihi atu ki a koe. The board continues to progress Te Putahi Nui o Rehua, a project investigating what developments can be carried out to improve and develop the current marae facilities. The project also encompasses the repair work covered under our insurance claims. After an open tender process we have engaged OPUS International to undertake the first stage of a design and feasibility study looking at options for the marae. We will keep you informed and involved as this work progresses. We recently underwent an audit of our Kaumātua Services and are working with the Canterbury District Health Board and an independent provider to ensure our kaumātua continue to receive the high level of care they deserve and to meet newly introduced national standards. 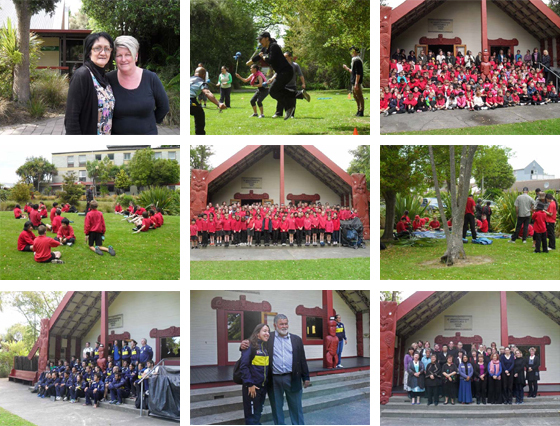 Rehua Marae continues to be busy hosting many school groups, visitors, wānanga and hui. 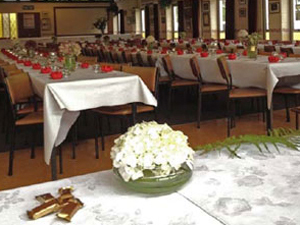 The marae looks beautiful and is a credit to our Manager Raylee and her team. E te iwi, anei ētahi tūranga hou, tēnā tono mai! The Rehua Board of Trustees is seeking an energetic and committed person to join the board. Rehua is a busy and vibrant city marae, dedicated to contributing to the cultural, social, educational and economic needs of its community. 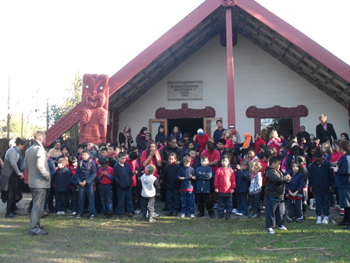 The marae has a whakapapa spanning 60 years which encompasses all iwi, races, religions and sectors of the community. The full board consists of seven Trustees, but currently we have one position vacant. If you have knowledge and experience in leadership, tikanga Māori, governance, management, finance, law, government relations, social services, community services, business, networking or contracting we would ike to hear from you. Tū te ao tū te pō ka ao ka ao ka awatea. The first Kahui Kaumātua Wānanga held on 17 February was a great success with an awesome turn out by kaumātua and the community. The kaupapa was around the Ratana and Wetereiana involvement with a historical account by Terry Ryan. The second wānanga on 17 March was just as successful with great kōrero around tikanga and other topics. The timing and venue coincide with whakamoemiti of the Hahi Rātana, held every third Sunday of each month. This is now set for the year and the invitation is extended to all. Nau mai, haere mai. After two years the small Whare Manaaki (rest room) for manuhiri at the Springfield Road entrance is functioning again. The main water pipe was ruptured two years ago, but has now been repaired. This will make things a little more comfortable for manuhiri, especially kaumātua, gathering to come on to the marae. Earthquake insurance related repairs are underway. Expect more work to be carried out over the coming weeks. 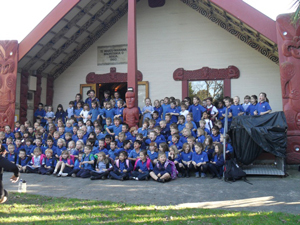 On Wednesday 27 February Rehua Marae ran the successful Whakamana Hauora Day. About 30 health related organisations set-up stalls and were on hand to offer advice and talk to visitors. While the number of visitors were relatively low, it was still a great event for providers to get together and network. These Hauora Days were a regular annual fixture on the Rehua calendar, but this is the first one to be held in a number of years. Judging by the success of this year’s we will be holding another one in 2014. 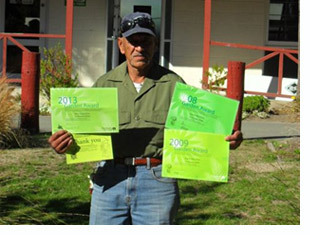 Harry Ehau has received the 2013 Burwood/Pegasus Community Board Community Pride Garden Award for the fabulous work he does caring for the Rehua Marae grounds. This is the third time Harry has received a Thank You Garden Award from the Christchurch Beautifying Association after recognition in 2008 and 2009. Rehua Marae staff, Elena, Raylee and Sammi (pictured) supported by Maureen, completed the 6km City to Surf Walk on Sunday, 24 March. It was a hot day with thousands of walkers and runners joining the annual event. Ka mau te wehi koutou!!! Firstly I would like to offer festive greetings to you and your whānau during this up-coming holiday break. For all of us here in Ōtautahi it has been a long and tiring year, so some rest and recuperation will be very welcome. In our first year as the new Trust Board at Rehua Marae there have been many changes. 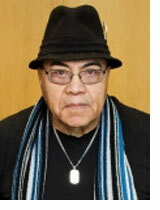 Three board members have left us, Whare Tamanui, Mita (Ted) Te Hae and Chris Ford. 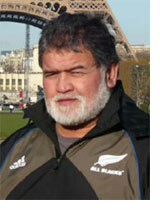 Three new Trustees have joined the Board, Ruawhitu Pokaia, Catherine Stuart and David Ormsby. 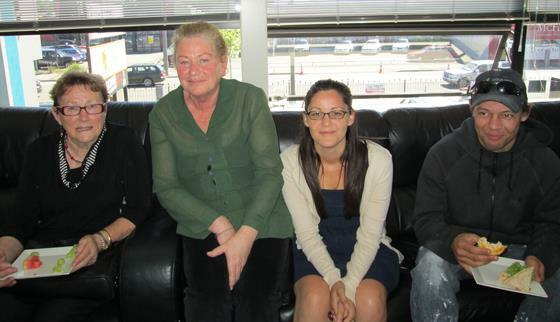 The Operations team has said goodbye to Maria Tait and welcomed on board Raylee Price and Elena Gapper. We are also saddened at this time, to farewell Chris Thomson and Rihira ‘Dolly’ Pitama who have worked tirelessly and with great professionalism to manaaki our manuhiri with magnificent kai. We wish both Chris and Dolly all the best with their future endeavours. Thank you to everyone who came to our Rehua Marae stand at the Ngāi Tahu Hui-a-Iwi, we have been able to add lots more names to our contact list and also to continue to build reciprocal relationships with our other marae in our rohe. It is also heartening to be able to report that Rehua Marae along with the Māori Wardens were nominated to receive Christchurch Earthquake Awards to recognise the important role they played in supporting the community after the February 22 quake. Terry Ryan accepted the award on behalf of Rehua. On behalf of the Trustees and staff of Rehua Marae I wish you all a safe and peaceful holiday season. I currently work for Te Kohanga Reo National Trust as District Manager of Te Wai Pounamu and are a member of the Board of Matauraka Mahaanui, (the Waitaha Advisory Board). I feel very privileged to have been selected as a Trustee to Te Whatumanawa Māoritanga o Rehua Trust Board. I have been involved with Rehua all my life and have strong whānau links to the marae since its inception through my grandparents and great grandparents and my mother Kath Stuart, nee Couch, who was a past chairperson. I look forward to working with the Trust Board as we move forward for the betterment of the Marae and its community. Nei ra te mihi ki a koutou katoa. My wife Toni (Ngāi Tahu, Arowhenua) and I have three children. I am totally committed to whānau, hāpu and Māori development aspirations. I spend a lot of my spare time supporting my children in sport and education, but also enjoy quiet opportunities to go fishing. I am the Regional Director for Te Puni Kōkiri, Te Waipounamu, a role I’ve held since April 2003. 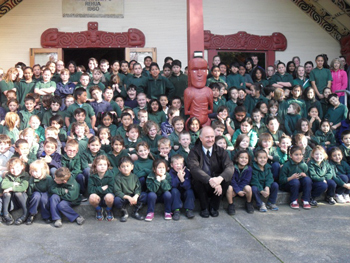 I have a background in education having worked for Te Tapuae o Rehua – the Ngāi Tahu tertiary education company and also within the Ministry of Education. It is an honour to join Te Whatu Manawa Māoritanga o Rehua Board as a trustee and I look forward to being able to make a contribution to the Rehua community. 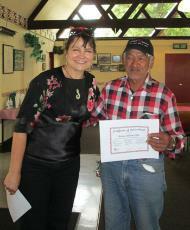 On behalf of Rehua Marae Terry Ryan accepted a 2012 Christchurch Earthquake Award for service to the community. Each year the Christchurch City Council honours outstanding citizens with a Christchurch City Council Civic Award recognizing service and contribution to the city. This year the Civic Awards have been amended so the many acts of kindness, service and heroism carried out as a result of the Canterbury earthquakes can be acknowledged. Terry, accompanied by Maria Tait and Ruawhitu Pokaia, accepted the award on Wednesday 18 January at a ceremony at the Christ College auditorium. The award recognises the extraordinary efforts of the previous Rehua Trustees, Bob Tai (chair), Terry Ryan, Marlene Kamo, Te Mairiki Williams, Jacky Te Wani and Garry Te Wani to keep the marae open and available during the earthquake response period. It was through the manaaki and aroha ki te tangata for all the volunteers, agencies and services that the name and mana of Rehua Marae was upheld and strengthened during this vital period of emergency assistance and aid. The current Trustees would like to take this opportunity to also thank and acknowledge the former trustees, the Rehua community and all those people from far and wide that worked together during this time. Rehua Marae has reinstated the concept of the Kahui Kaumātua council, which Uncle Wera Couch instigated before the building of the Wharenui in 1957. 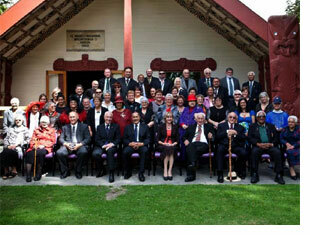 They meet regularly and endeavour to guide the Trustees on tikanga and cultural issues. Rehua Marae has successfully tendered for the contract to assist with the promotion of the Māori Electoral Option Campaign. The Māori Electoral Option occurs approximately every 5 years and provides eligible voters of Māori descent the opportunity to either register on the Māori Roll or the General Electoral Roll, or alternatively registered voters of Māori descent can choose to change the roll they are currently on. This Māori Electoral Option campaign commences 6 February 2013 and the option to is available from 25 March – 24 July 2013. As part of the campaign Rehua Marae will present public information and education material to whānau attending hui at Rehua Marae. Will recommence in January 2013. 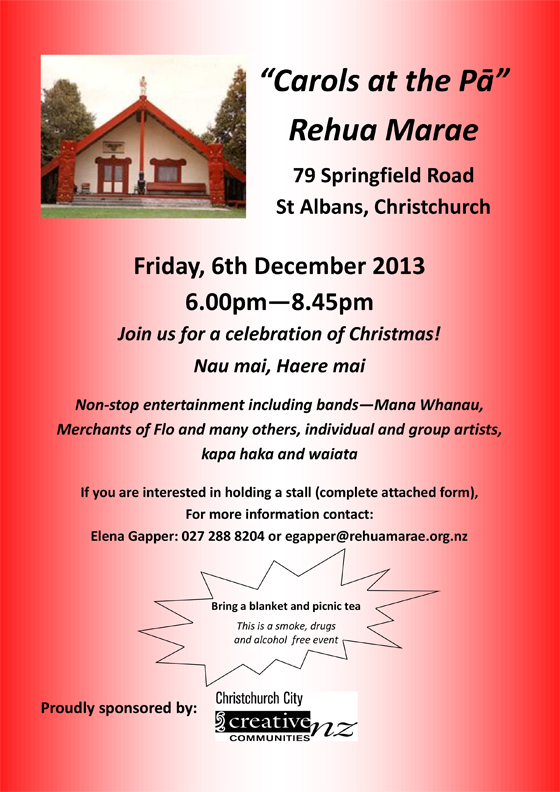 Rehua Marae will close of Friday 21 December, 2012 and reopen Monday 7 January 2013. Kaumātua Services will close Friday 21 December and reopen Monday 14 January, 2013. For any after-hours emergencies or enquiries about tangihanga please contact Marae Manager Raylee Price on 027 245 5475. Ka tangihia ngā tini mate o te wā. Kua karangahia koutou e Tahu Kūmea, e Tahu Whakairo. Whakawhiti atu rā i te pae o maumahara, ā, waiho atu mātou te tewe muri nei hei hopo, hei haku mō koutou. Rātou ki a rātou, ā, tātou ki a tātou. E ngā mana, e ngā reo, e ngā manukura o te motu, nei Te Whatumanawa Māoritanga o Rehua e mihi kau atu nei, e whakamānawa atu nei. Naia tā mātou pānui tuatahi hei tirotiro mā koutou. E te iwi, nau mai, tauti mai rā. Kia Ora koutou, it is my pleasure as the new chair of the Rehua Board of Trustees to greet you and introduce our new pānui. It will be a regular newsletter available by email to help keep whānau and friends up to date about what’s happening at the marae. Many of you will know that a new Board of Trustees was appointed in December last year. On behalf of the new trustees, Rehua whānau and friends I wish to acknowledge the work and dedication of the previous board members. Thank-you to each of you for your service to whakamana the marae and support the special place it holds in our local and regional communities. In particular I must make special mention of Terry Ryan who served on the board for more than 35 years. Terry and Rehua are inseparable and the new trustees are fortunate that he continues to support and guide our work. Also to Bob Tai the immediate past chair for nine years’ service and Marlene Kamo who has been on the board for 15 years and been a supporter of the marae for many, many more. Thank-you also to Te Mairiki Williams, Garry Te Wani and Jacky Te Wani. The new trustees are Mita “Ted” Te Hae (Waikato-Tainui), William “Bill” Bush (Ngāti Tūwharetoa, Te Whānau-a-Apanui), Chris Ford, Paula Rigby (Ngāti Kahungunu, Ngāi Tahu), Phil Tumataroa (Ngāti Kahungunu) and myself, Dora Langsbury (Ngāi Tahu). Whare Tamanui (Ngāti Pourou) was also appointed as a trustee, but unfortunately has had to step down from the board for personal reasons. The trustees wish to thank Whare for the work he has done in the short time he was chair and wish him well for the future. The trustees have had to find their feet quickly as there is a lot happening and a number of pressing issues affecting the marae as a result of the earthquakes. To briefly mention a few we are continuing to develop the strategic plan started by the previous board to help guide the future direction of the marae, we have been working to secure insurance for the marae and its buildings as well as dealing with EQC and the insurers regarding the repairs and remediation required as a result of quake damage. There has been a lot of effort put into securing the financial position of the marae. We have set-up project teams with each trustee taking on responsibility for a different area of expertise. 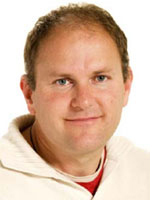 See the trustee profiles below for more detail about these. It is also appropriate to thank Te Rūnanga o Ngāi Tahu which came to Rehua at the invitation of the previous board and has made available a number of staff and resources to support the marae during this period. The board also wishes to acknowledge the Rehua staff and our kaumātua, in particular the paepae who take the time out of their already busy days to be at the marae for daily Powhiri and work together day in and day out to ensure the mana and tikanga of the marae continues to be upheld. The board looks forward to being able to keep you up to date with what’s going on at the Rehua and having whānau and the community involved in the activities and future of the marae. In March we held our third strategic planning hui. Bill and Whare were at the marae early preparing the pork bones and watercress. We had a pretty good turn out with about 40 people representing whānau and community spending their Sunday afternoon together. Ensuring we continue to remember and honour the history of the marae and those people and organisations that have supported us over the past 60 years and more. Caring for our kaumātua and supporting the provision of services to ensure they are well cared for and able to participate in our community. Upholding and respect tikanga so that the marae operates according to the kawa observed by mana whenua. 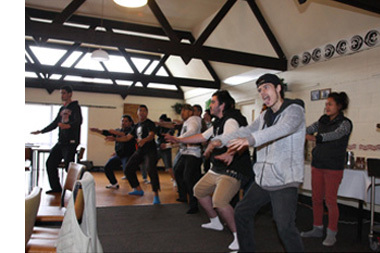 Ensure the marae continues to flourish and be available for the community. We appreciate all the views that were expressed, and heard clearly the aroha and commitment which exists within the community for the marae and the role it plays. As a board we want whānau and the community to be engaged and have a voice in the planning process. The next step has been to develop a draft strategic plan with some high level ideas and initiatives on how we see the marae developing in the future. We have this completed invite you and the community to attend a hui on Sunday July 8 to present the plan and seek further feedback. The Rehua archives project, which sets out to protect the thousands of documents, photos and records of Rehua from the past 60 years, has been on-going for two years. It has been guided by Terry Ryan, and Marlene Kamo has been driving the mahi to locate, identify, sort and store these toanga. She has also been well supported by whānau and the Rehua community. The project has now reached a stage where all the material collected thus far needs to be professionally archived and protected under conditions that will see it safe from further deterioration and out of harms’ way. Rehua does not currently have the space or the correct facilities to keep the archive in a manner that will keep it safe, which has been an on-going concern for the board and the project team. However, we have received a generous offer from the Christchurch City Libraries which is prepared, at no cost, to professionally archive and store the taonga in climate controlled storage facilities. This will mean that all the records will be scanned and digitally archived and placed in the Libraries’ care until we are able to find an appropriate solution at Rehua. The archives will remain the property of Rehua and a condition of the agreement is that Rehua can request the archives to be returned at any time. The board has agreed that this is the best solution in the interim and a very generous offer on behalf of the Libraries staff and the Christchurch City Council. Over the coming weeks we will be working with key staff to see this stage progress. The trustees would like to thank Terry and Marlene for leading the first stage of this vital piece of work. If old boys/girls or whānau have any personal material donated to the archives project and have questions we invite them to contact the board to discuss the process. The board has received feedback about the process used to appoint the new Trustees. The current process, ratified by the previous board, consisted of seeking written applications from candidates which were reviewed by an appointment committee consisting of Rakiihia Tau, Clare Williams, Norman Dewes and Mark Solomon. Based on the applications the appointment committee selected five people to be offered positions on the board. Two further Trustees were appointed, one as representative of the Kaumātua and Te Haahi and one by the old boys/girls as their representative. In light of the feedback received to date the new Trustees have agreed to review the process and to consult with the Rehua community, the Kahui Kaumātua and the Old Boys/Old Girls. The Trust Board calls for interest and gives people the opportunity to put their names forward. The Trust Board receives and reviews the applications. The Trust Board appoints the new Trustee(s) by Resolution of the Trust Board. We invite you to send us your views about the current process, our preferred process and what you think is an appropriate process for the appointment of Trustees. This is a timely issue as we have accepted Whare Tamanui’s request to step down from the board and will be needing to find a replacement as soon as possible. Maintenance is ongoing and there is still a lot to be done around the marae. While the grounds look beautiful, the buildings are looking tired including the wharenui, which has issues with its floor, and the wharekai has a leak when we get a bit of rain. The Rehua properties have been quite badly affected by the quakes. Engineers have advised that the small annex at the end of Te Koti and the building occupied by the Maori Land Court are not safe but otherwise we are fortunate that all other buildings are safe to be occupied. We are working with EQC and our insurers to assess the damage and a understand our options concerning repairs or rebuilding. The warrant of fitness for Te Koti (administration Block) has recently been renewed. There are a number of other jobs that need to be done and will take place over the coming months. The board is beginning to develop a web site for Rehua. 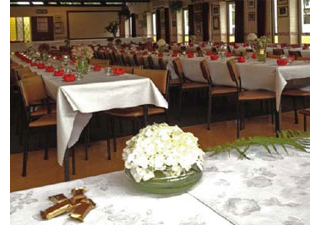 The marae has a number of pages on other organisation’s web sites, but does not currently have its own dedicated site. A website will allow us to record the history of Rehua and acknowledge those key people and organisations that have contributed to the whakapapa of the marae. The site will also be useful to help promote the marae and its services more effectively and will assist staff manage bookings and enquiries. We have secured the domain name www.rehuamarae.co.nz and will begin to develop the site over the coming months. We’ll keep you up to date on progress. June 16 – Soul Sistas – Wahine Pamper Day, massage, hair and make-up, relaxation. An event run by He Waka Tapu. June 25 – Rehua Board of Trustees meeting at 6pm. June 30 – (10am – 4 pm) – 10am – 4pm) Matariki Whānau Day – stalls, workshops, storytelling and waiata. 1 – 2pm – “Muse” Random Acts of Music (Free to participants). A session where whānau will get the opportunity to play an instrument. 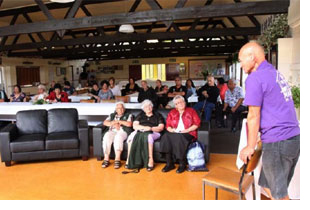 July 1 – Rehua Marae Strategic Planning hui. 12.30pm start. July 23 – Rehua Board of Trustees meeting at 6pm. August 27 – Rehua Board of Trustees meeting at 6pm. What’s been happening at Rehua? 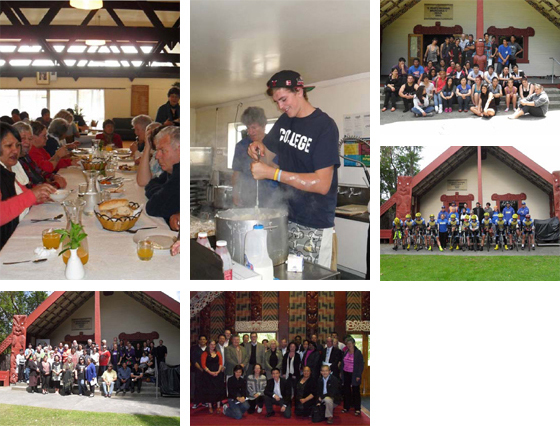 Rehua has been very busy over the past months hosting whānau, community, business and school groups from all over the motu. The ability to appropriately host and manaaki our manuhiri is at the heart of our marae. 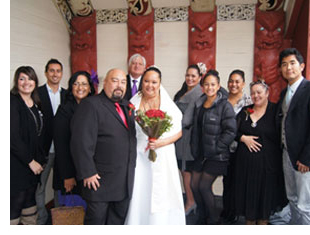 Aaron Nicol (Ngāti Porou) and Alice Manadaniels (Te Aupouri and Te Rarawa) were married at Rehua Marae on May 5 in the wharenui. About 100 whānau and friends gathered for the occasion. 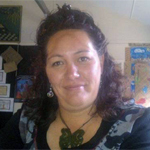 Alice works for Te Puni Kōkiri and is based at Rehua. “It was a fantastic day” she says. In February, Ngāi Tahu whānau led by Ngāi Tūāhuriri welcomed His Excellency, Lt Gen The Rt Hon Sir Jerry Mateparae, Governor-General of New Zealand and Lady Mateparae to Ōtautahi at Rehua Marae. Sir Jerry and Lady Mateparae visited Christchurch to awhi the people and take part in the anniversary commemorations for the February 22 earthquake. 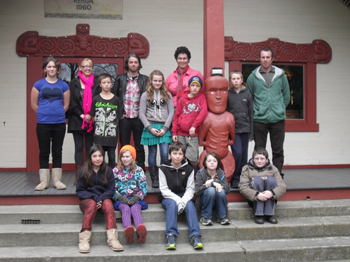 It was the first time in nearly twenty years that Government House has visited Rehua Marae. I was born and raised at Ōtākou Marae on the Otago Pennisula. As a teenager I was a national level swimmer and New Zealand title holder for surf lifesaving. I trained as a primary school teacher and then went on to have an international marketing and business career in the computer and telecommunications sector, based in Asia and the USA. Since my return to New Zealand I have worked as a marketing and business consultant for Ngāi Tahu and as a business tutor at Te Wānanga o Aotearoa, where I now work as the Student Support Advisor for the Ngāi Tahu rohe. I am passionate about the Green Party and have stood as their Te Tai Tonga candidate and are currently their Māori policy convener. I am the Co-Chair of One Voice Te Reo Kotahi and an active member of the Peterborough Village Precinct, the location of Tautahi’s wāhi tapu site. I first became involved at Rehua in April 2011 following a request by the Rehua Trust Board that Te Rūnanga o Ngāi Tahu provide some assistance for the board. I live nearby Rehua and have always been curious about the marae so I am enjoying the opportunity to spend time here and get to know what goes on. My role is to co-ordinate support for Rehua from Te Rūnanga, for example helping support the staff, IT, property management, finances/accounting and legal matters. Since April 2011 the team at Te Rūnanga has put a lot of time and effort into supporting Rehua which has been great. I am currently the Treasurer of the board. I am married to my beautiful wife Cheryl, and have a 9 year old daughter, Isobel. I am the daughter of Rehua Old Boy Paku Rigby, and was at Te Kaihanga Hostel in 1980. I’m honoured to be the Old Boy/Girl representative on the Trust Board. 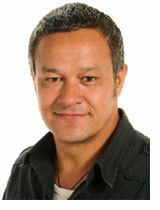 I am actively involved in the Māori arts, as a weaver and kapa haka performer. I am on the funding committee for the Trust and work on events for the Marae. I am from Hamilton, but have lived in Christchurch for the past 55 years. Much of that period I have been involved with Rehua, spending time with the old people and supporting the paepae. I have spent many years involved with community work and was honoured to receive a QSO for this work. 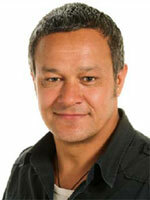 I am currently employed by the Canterbury District Health Board and am a kaumātua representative on the Trust. I was educated at Whakatane High School and have lived in Christchurch since 1967. I am a member of the Rehua building committee. My father and many of my “uncles” are old boys of Rehua and Kaihanga, so to be able to help support the marae and its special place in Ōtautahi is a real honour for me. I work for Te Rūnanga as the Group Communications Manager. My partner Belinda and I have three children, Madison (12), Phoenix (10) and Noah (8). I am on the communication and funding committees.